Rock Hill Coca-Cola Bottling Company entered into the 21st century with a new leader at the helm. Fred Faircloth, III, grandson of William Mark Mauldin, had served several years as the general manager. His mentor and uncle, Billy Mauldin, had provided Fred exposure and training in a variety of responsibilities in the company. When Billy decided to relinquish the reins of management, he did so with great pride and comfort, knowing that Fred would continue the legacy of his father and himself. As a young man, Fred began his Coca-Cola career by spending the summer of 1968 working at the plant and learning the business from the ground up. 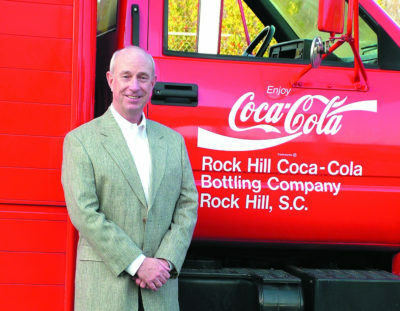 After graduating from Clemson University in 1972, Fred returned to Rock Hill and in 1972 began his 30+year career with Rock Hill Coca-Cola Bottling Company. Fred Belongs with the Rock Hill Coca-Cola Bottling Co.
Fred was like his grandfather in many ways. He sought a profession that would provide for a family and allow him to grow a business and be involved in the community. He knew Rock Hill; he knew Rock Hill Coca-Cola Bottling Company. It was a logical decision to begin his business career in the company. After a short time Fred realized that he truly loved the Coca-Cola business and never looked back or sought a different career. This is where he belonged. Childhood memories of visiting the plant after a day at Winthrop Training School, going to the plant’s break room and downing that free cold Coca-Cola, and returning to Rock Hill for the summer job all paved the road for the rewarding career. Fred recalled Billy’s patience as he taught him each new responsibility. On June 10, 2002, Fred was named president of the company. His responsibility as general manager (and all the other years of training) had prepared Fred to take over the mantle of leadership when his uncle Billy died in March of 2002. The same week that he was named President, he also received the honor of being named a Paul Harris Fellow by the Rotary Club, an honor bestowed on members who exemplify the motto: Service Above Self. It was evident that Billy, who was a civic-minded man who constantly gave of himself in service and was generous to those programs that benefited the community of Rock Hill, had a strong influence on Fred. Fred had served as Chairman of the Come-See-Me Festival Board and the Friends of Historic Brattonsville. He chaired the Olympic Torch Relay in Rock Hill and was the first president of the City Club and has served as president of the Rock Hill Country Club. Fred served on the Cultural and Heritage Commission, the York County Tourism and Sports Commission and the Rock Hill Zoning Board, is a corporate partner with several area schools, sponsored numerous soccer and baseball teams and provided scoreboards all over the city. Fred’s loyalty and support for his alma mater, Clemson, is evidenced by his service the past-president of the Clemson Alumni Association and a national director of IPTAY. Along with his service to the Rotary Club, where he served as President, Fred is a loyal member of St. John’s Methodist Church where he served as Chairman of the Administrative Board. Fred truly understands the heritage of his grandparents and uncle: giving back to community. The legacy of his grandparents, Mark and Mayme Mauldin, together with the guidance and support of his parents, Fred and Ann Bruce Faircloth, provided Fred a blueprint for a strong and productive business management style. These two individuals were risk takers, partners, and civic-minded individuals. Their caring nature flowed into their business, the community and their family. As Fred stated, they were wonderful examples of all that parents, grandparents, employers and business people would desire to be. They always sought ways to give back to the community and took care of their employees. Quality product was the standard by which they did business.